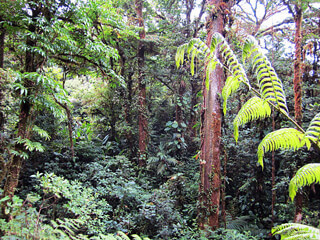 Monteverde’s cloud forests sit atop the crest of the Cordillera de Tilarán mountains. When precipitation rises and flows over the peaks, moisture hits the upper windward slopes and forms clouds. The result is a forest ecosystem drenched in mist, from the canopy to the soil. These forests are renowned for their lush vegetation, high levels of plant biodiversity, and the presence of unique species found nowhere else on earth. Layers upon layers of plants cloak the stunted, gnarled trees in the elfin forest that grows at the highest elevations. Mosses, lichens, orchids and other epiphytes abound, and the area’s plant list documents thousands of species. 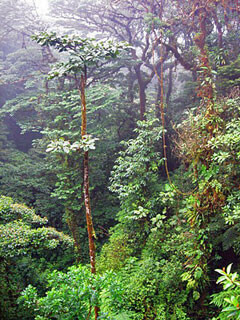 Cloud forests are globally uncommon yet biologically significant. In addition to their high levels of species richness, they play an important role in watershed ecology. Unfortunately as with many tropical ecosystems, they are threatened by numerous forms of human disturbance. Read the full article to learn how even soaking-wet cloud forests can eventually get thirsty, and how they stay hydrated during dry conditions.